SLC activists demand freedom from ICE detention for transwoman Nicoll Hernández-Polanco | Fight Back! "Hi, I'm calling to demand DHS/ICE release Nicoll Hernández-Polanco (A089-841-464). Nicoll is a Guatemalan transgender woman currently being detained at an Immigration & Customs Enforcement (ICE) all-male ICE facility in Florence, AZ. She continues to be a target of sexual harassment and abuse at the hands of ICE and staff for being a transgender woman. She needs to be released now." Follow updates about Nicoll Hernandez-Polanco on social media using hashtag #FreeNicoll. Salt Lake City, UT - The detainment of Nicoll Hernández-Polanco is sparking protests across the country with Utah joining the fight. Nicoll Hernández-Polanco is a Guatemalan transwoman seeking asylum. However, she is currently being held in the Florence Service Processing Detention in Arizona. Hernandez-Polanco remains incarcerated in the men’s side of the detention center where she faces sexual harassment and assault. 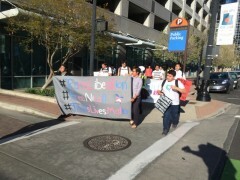 In Salt Lake City, 20 activists rallied to support Nicoll Hernandez-Polanco at the Matheson Courthouse, rallying with signs and banners. Some wore striped prison shirts and zip ties binding their wrists in symbolic solidarity. “It’s an UndocuQueer issue,” said Eusebio Echeveste, an organizer with Utah’s Familia TQLM, explaining that people who are both undocumented and Queer face particular hardships.